Blackbird’s “Orbs” are a great aviation marketing tool for product and brand recognition. This easy to install name plate fits in the bearing bore area of a wheel and is used to protect unattached bearings in transit while promoting your business. 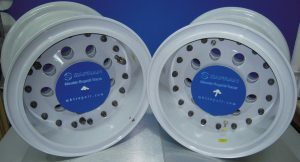 Your wheels can stand out from the rest simply by incorporating your logo or company information. They can also be attached on the outside of wooden boxes and crates to instantly identify your company and/or products. Highlight your company name, phones numbers, email addresses and web site from the time your wheel or box leaves your facility or repair shop until it reaches the consumer. Blackbird can work from your design, modify one of our existing designs or have our team create something unique to promote your business.“Orbs” are secured to the unit using a plastic threaded rod and wing nuts or any other hardware as required to secure for shipping purposes. Manufactured to the highest standards in the industry, the high-density polyethylene is environmentally stabilized to handle abuse. “Orbs” will never fade or discolor in direct sunlight. And you never have to worry about delamination, rotting or warping.“Orbs” make great calling cards and drink coasters for customers and trade show giveaways. Promote your business and ensure product visibility today. Please contact us at (954) 482-4269 or sales@blackbirdfyi.com for more information. *”Orbs” are made available to customers for advertising/marketing purposes only and may not be used for any other purpose.